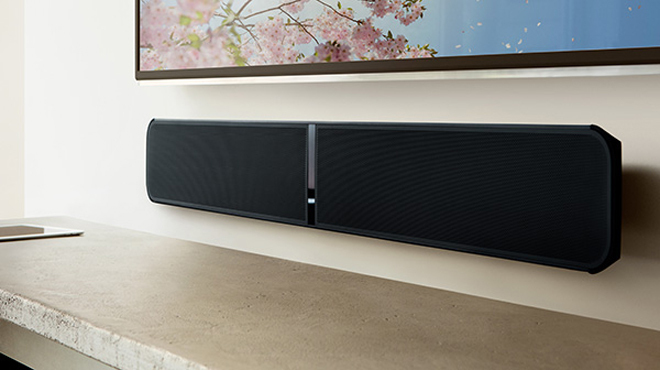 Overview -- The Bluesound Pulse Sound Bar offers impressive 2-channel music and movie performance, along with robust wireless connectivity and hi-res music streaming support. But some key design choices might limit the device's appeal in a modern home theater setting. Still, as a dedicated music sound bar, it's hard to beat and, if the unit's large height and lack of HDMI aren't deal-breakers, then this is an easy recommendation. Otherwise, we'd suggest another audio solution. Worth a Look. Part of the Lenbrook Group of Brands that also includes NAD Electronics and PSB Speakers, Bluesound is now in its second generation of gear and continues to use the 50 years of audio expertise from its related companies to its advantage. Made "by audiophiles for audiophiles," the company's products emphasize sound quality and hi-res music support, offering the convenience of multi-room wireless connectivity without losing the ability to produce studio-master-level audio. 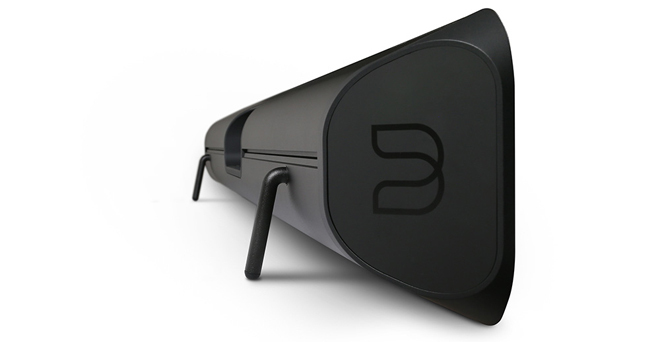 The Bluesound Pulse Sound Bar is a 120 watt 2-channel sound bar system with an ARM Cortex - A9, 1 GHz processor. A 120V AC power cord, a 230V AC power cords, a stereo RCA to RCA cable, an Ethernet cable, two kickstand feet, two kickstand extenders, a wall mount bracket, and a wall mount bracket template are all included in the package -- though sadly, the unit does not ship with a remote of its own (controls are handled by a mobile device or a user's existing IR remote) or a digital optical cable. 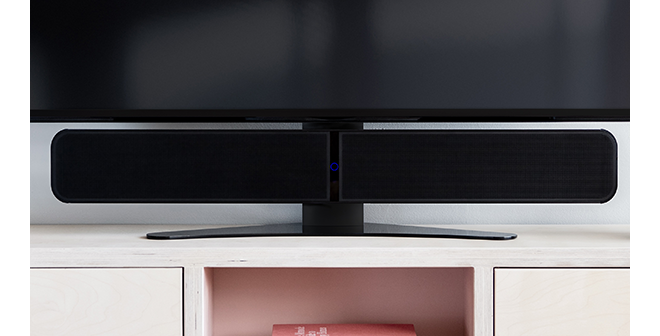 From an aesthetic standpoint, the sound bar features a premium look with a sturdy metal design marked by rounded corners, non-removable grills, and a stylish LED ring indicator light in the center. The LED can glow or flash blue, red, green, or white to signify different statuses. Units are available in black or white (our loaner was black). The sound bar measures 42.25” x 5.5” x 2.75” and weighs 15 lbs. not including the wall bracket or kickstands. This comparatively large size is likely to be a potential deal-breaker for many potential buyers. Though quite attractive and well-made in construction, the 5.5" height could pose some challenges when placing the sound bar in front of many televisions. In fact, this proved to be an issue for me as the Samsung TV I paired it with had a much lower profile than that, causing the bar to cover part of the screen. To compensate, I ended up propping the display upon an empty box, but this would not work as a long-term solution. To solve the problem, Bluesound actually makes its own Universal TV Stand built to house the sound bar and a display (up to 65-inches). And though this likely works quite well, it's a bit ridiculous to ask customers to pay an extra $300 just so they can get proper placement for the $800 sound bar. Under the hood, the unit features 6 Integrated high-performance speakers, including 2 x ¾" (19mm) soft-dome tweeters, 2 x 2” (50mm) treated paper cone mid-ranges, and 2 x 4” (102mm) rubber surround woofers, along with 2 Passive Radiators. The frequency response is rated for +/_ 1dB 70Hz - 20kHz, 3dB down @ 55Hz. The back of the unit includes all of the wired connection ports, including a Digital Optical input, an Analog RCA input, an RCA subwoofer out, a Gigabit Ethernet RJ45 jack, a USB 1 x Type-A (Fat32 Formatted) port for connection to USB memory sticks and supported peripherals, and a Type-B (mini) for product servicing. 802.11 b/g/n WiFi and aptX Bluetooth wireless connectivity are built-in as well. Unfortunately, the sound bar does not include any HDMI ports or video pass-through support. According to the manufacturer, this omission was made to help simplify setup and focus squarely on audio while letting a user's display handle all the other work. In addition, the device includes a wireless subwoofer transmitter allowing users to add a separate Pulse Sub for even more robust LFE. Likewise, customers can also wirelessly pair two Pulse Flex speakers with the system to serve as rear satellites, completing a full surround sound setup with wireless Dolby Digital 5.1 compatibility. Meanwhile, music playback is supported for MP3, AAC, WMA, OGG, WMA-L, ALAC, and OPUS files, along with Hi-Res formats like FLAC, MQA, WAV, and AIFF. After unpacking the sound bar and attaching the kickstands, setup is fairly straightforward -- though users will need an iOS or Android device to handle the process since the unit does not feature a dedicated remote. To begin, download the BlueOS app on an iOS or Android smartphone and then simply turn the sound bar on. Once the app recognizes the device, you'll be able to input your Wi-Fi info into the phone and get the sound bar connected. From there, the Pulse will download an update if necessary. This process will likely take a few minutes, but once the sound bar is ready to use the front indicator light will become a solid blue color. At this point, users can start streaming music from the BlueOS app directly to the Pulse via Wi-Fi or Bluetooth, or switch inputs to one of the device's wired connections. The app features a clean interface with integrated access to locally stored MP3s or hi-res files, and a variety of internet radio platforms like TuneIn Radio, iHeartRadio, Calm Radio, and Radio Paradise. Likewise, users can stream tracks from platforms like Amazon Music, WiMP, Slacker Radio, Qobuz, HighResAudio, JUKE, Deezer, Murfie, HDTracks, Spotify, TIDAL, Napster, KKBox, and Bugs Music. And though users will initially need to open apps like Spotify separately -- once started, playback can be controlled via the BlueOS app as well, complete with Spotify album art and track info. 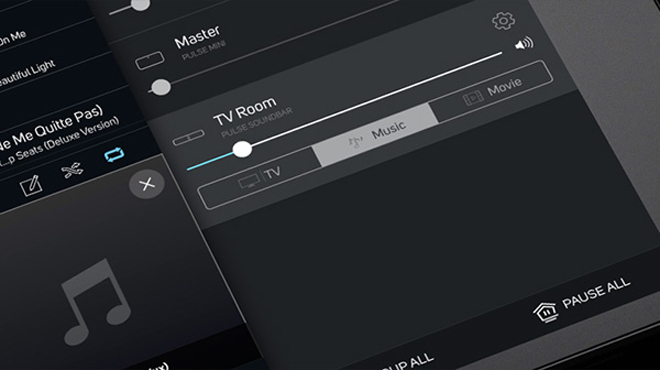 In addition, the app also offers a variety of audio adjustments for the Pulse, allowing customers to select different Movie, TV, and Music presets with individual settings for treble, bass, dialogue enhancement, a wide mode for enveloping sound, and more. Though I typically like to listen to music in standard stereo mode without any extra processing, I actually found that the wide mode added a welcome sense of space to most tracks, offering a pleasing yet subtle level of reverb that gave playback a live concert quality. Likewise, the wide mode gave movie and TV material an extended sense of separation. In general, navigation and playback through the app were quite responsive and, unlike most mobile apps I've tested with various devices, I didn't run into any major glitches or hiccups. With that said, I do wish that Bluesound also included a traditional click button remote as part of the package. As it stands, the primary way to control playback, adjust settings, and change sources is via a mobile device, which can be a bit annoying when you sit down to watch TV. Likewise, it drains a smartphone's battery quite fast. Thankfully, the player can program IR commands for basic functions like volume and play/pause to an existing IR TV remote, but a simple yet functional dedicated remote for the sound bar itself could go a long way. Finally, to help maintain usability at all times, the Pulse Sound Bar is designed to automatically enter a Power Save mode (less than 6.0W of power) after 15 minutes of being idle. In this mode, the sound bar is able to conserve energy while remaining available on the network and responsive to app commands. Though this is a nice function, I do wish the LED indicator light changed in some way to confirm this status. Instead, the light remains a solid blue whether active or in Power Save mode. To test out the Pulse Sound Bar's music performance I listened to a variety of hi-res and MP3 files, along with many streaming tracks from several sources, including Spotify and Internet Radio stations. Playback was primarily handled via a Samsung Galaxy S7 smartphone through both Wi-Fi and Bluetooth connections. Overall, the sound bar provided a genuinely impressive and wonderfully versatile sonic profile, suiting a wide range of music styles with a deep, full, and rich sound. In fact, when it comes to music playback, this is easily one of the best sound bars I've heard so far, lending a pleasing sense of dimension to a diverse collection of tracks by artists like Radiohead, Demi Lovato, Daft Punk, Arianna Grande, Arcade Fire, Norah Jones, Gnarls Barkley, Nicki Minaj, Lady Gaga, Fleet Foxes, Cardi B, and more. Pop songs, like Arianna Grande's "Focus," sounded especially punchy with a smooth mid-range and strong dynamics, offering a wide range of varied frequencies with a deep, steady beat maintained behind clean, crisp vocals. On that note, bass activity was surprisingly effective even without a separate dedicated subwoofer system. Tracks like Gnarls Barkley's "Crazy," Daft Punk's "Get Lucky," and Cardi B's "I Like It" all carried full-bodied low frequencies with a deep and cohesive thud. Low-key songs like Norah Jones' "Don't Know Why" also came through with precision, resulting in an intimate tonal quality that delicately resonated throughout the room. Stereo separation was also very impressive, creating a wide sense of imaging between channels. Pink Floyd's "Money" and "Shine On" were especially noteworthy in this department, spreading cash register effects and other ethereal ambiance to the left and right. Of course, as warm and balanced as most material sounded, music reproduction wasn't always quite perfect. In some instances, the sound bar seemed to have a slight bias toward the high-end of the midrange, and there could be a minor gap between the mids and deeper low-end of some tracks. All things considered, the Pulse proved to be an excellent solution for music, fulling living up to Bluesound's audiophile claims while often coming across more like a full-fledged stereo speaker system than a typical sound bar. For movie and TV testing, I hooked the sound bar up to a Samsung 4K Smart TV and an LG Blu-ray player via an optical cable and watched a variety of streaming shows and Blu-rays, including titles like Guardians of the Galaxy, Captain America: Civil War, Jupiter Ascending, Edge of Tomorrow, Wonder Woman, Justice League, The Tick, and The Unstoppable Kimmy Schmidt, along with clips from Dolby and DTS demo discs. With that said, the device does not include internal DTS decoding support, so users will have to make sure to set their TVs or media players to PCM when playing DTS content. In general, the Pulse was capable of producing a wide and engaging soundscape, resulting in immersive stereo separation. The sound bar could never really compete with a genuine surround sound system, but performance was very solid for a single-unit 2-channel device. The "No Man's Land" sequence in Wonder Woman proved to be an especially great example of the speaker's strengths, spreading whizzing bullet fire to the left and right with precision and smooth imaging. The scene's rousing music came through with full-bodied heft as well while maintaining good balance between all of the effects. LFE also packed a decent punch, though the sound bar's limitations in this regard were a bit more apparent when playing movies instead of music. Other action-heavy scenes, like the beach invasion in Edge of Tomorrow and the airport battle in Civil War, were similarly dynamic while offering distinct directionality. I was especially impressed by how wide the front soundstage could be, allowing the sound bar to extend audio far off to the sides of the room. Even subtle background effects, like police speaking on their radios during the Superman returns scene in Justice League, were given ample presence and separation. Of course, switching to the sound bar from my full surround system during playback did reveal some of the Pulse's understandable limitations, offering a notable downgrade in bass, general range, and immersion due to a lack of surround speakers and a subwoofer. And though the sound bar's Wide Movie setting did provide a nice expansion of the soundfield, some other sound bar's with more sophisticated virtualization and beam drivers are capable of a more convincing sense of space. Finally, while dialogue came through well enough, speech had a thin quality at times and the low-end in dialogue could sound a tad harsh in some scenes. The Pulse Sound Bar lives up to its promise of audiophile quality, especially during music playback. Likewise, the system uses a well-designed mobile app and includes robust hi-res support, along with Wi-Fi and Bluetooth wireless connectivity and optical wired connectivity with Dolby Digital compatibility. When it comes to pure sound performance, it really is an impressive device. Unfortunately, there are some other factors that take away from the unit's appeal. The 5.5-inch height makes placement very difficult with most TVs unless you want to wall mount or are willing to shell out an extra $300 for Bluesound's own TV Stand. And considering the MSRP is already a little steep for a 2-channel sound bar, that seems like a lot to ask most buyers. On that note, while the black unit is supposed to retail for $799 following a price cut earlier this year, for some reason Amazon currently has it listed for the old $999 MSRP. Meanwhile, though audio performance is very strong all across the board, the lack of HDMI connections, video pass-through, or even an included optical cable makes movie and TV support feel a little dated in the age of 4K HDR and Dolby Atmos. And while the mobile app is quite responsive and basic functions are programmable to an existing IR remote, a dedicated click button remote would still be ideal. Still, when it comes to actual audio playback, this is easily one of the best 2-channel sound bars I've heard. If you can fit it with your display or you are looking for a sound bar to use primarily for music separate from a TV, this is a great option. All things considered, the Pulse Sound Bar is Worth a Look.